The Inquisitors of the Ordo Malleus and the Space Marines of the Grey Knights are the chosen warriors of the God-Emperor, tasked with keeping humanity from falling into darkness. They hunt tirelessly to rid the Imperium of their collective prey: Daemons. 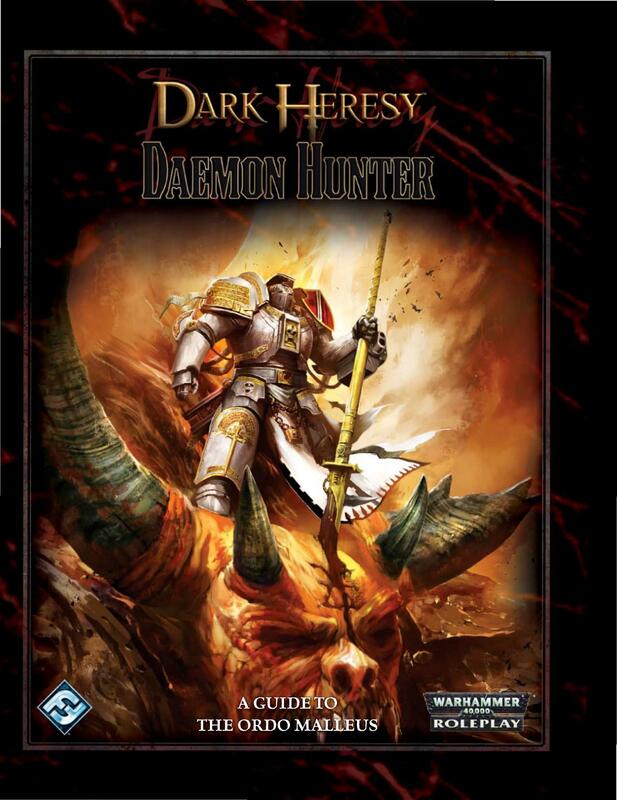 Daemon Hunter is a powerful resource for any Dark Heresy campaigns featuring the servants of the holy Ordo Malleus of the Inquisition. With information and background on the Ordo Malleus in the Calixis Sector, the Daemon hunterâs trade, and the Malleus armoury, Daemon Hunter is the perfect companion for players and GMs alike who wish to craft exciting campaigns for Dark Heresy. 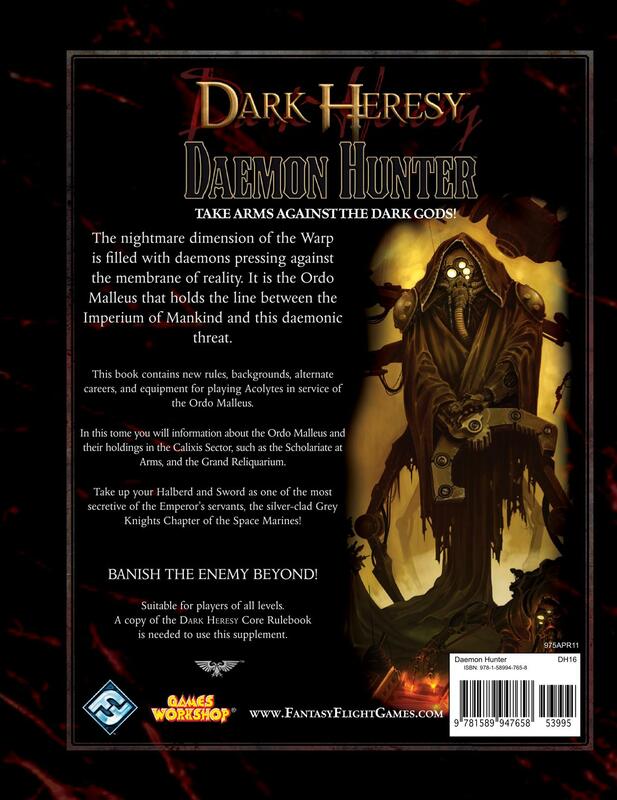 Finally, Daemon Hunter includes everything players and GMs need to include Grey Knights into their Dark Heresy campaigns! Matthew Eustace. âFuries for Everyone!â David R. Schumpert III Esq. with Adam Schumpert, Pierre Wagenseil, Marthinus J. Linde, David Hudock, Paul Shivery, Nathan Walters and Chris Hebert. Charles Kellner with Eve Bloom, Jacob Martasek, Jeff Rubinoff, Megan Cook and Pavel Ort. Dave Cerezo with Andrew Schneider, Dave Evensen, Gregory Sabino and Peter Burke. Michael Underwood with Aaron Bond, Andrew Fields, Jason West, John Beavers and Nathaniel Nicholson. âNo Guts No Gloryâ Sean Connor, Stephen Pitson, Mark Smith, Michael Thompson, Adam Lloyd, Aaron Mcmanus-Wood and Simon Tierney. âBolter and Chainswordâ Ryan Powell, Jon Cox, Max Hardenbrook, Matt Bogart and Richard Sanders.